When the people greeted Jesus with palm branches, what were they hoping for? When I come to God, what am I hoping for? Why the cross? What does it mean? Why my pain? What does it mean? Last Sunday I preached at our church to kick off Holy Week, exploring the strange events of Palm Sunday and the hopes and aches we all can’t seem to shake. From the children of Israel who wondered if God had brought them through the waters to freedom only to abandon them in the wilderness, to my own heart in Silicon Valley where I find myself bitter about the Tesla next door, this is a message about looking again at Jesus and finding our story in His story. On Sunday, I preached for the first time at our new church home in San Jose, The River Church Community. Our Advent series is based in the stories about Jesus’ birth from the book of Matthew. 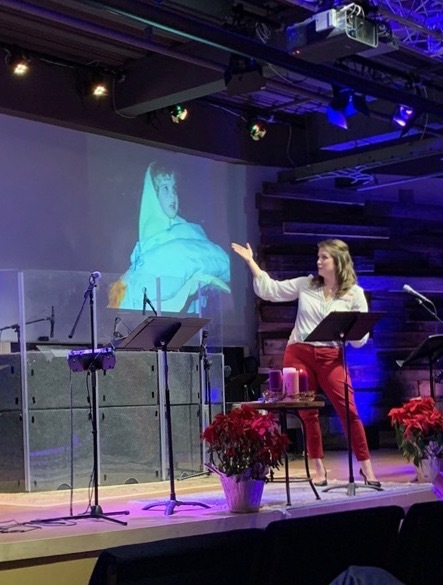 Last week our lead pastor taught from the genealogies of Jesus, highlighting how the inclusion of women, and marginalized women at that, helps us see a God who is for all. This week we read the Epiphany story, finding ourselves on the Magi’s journey, looking at the ways God reveals himself to everyone, even those a long way off from faith. Unlike Mary, Joseph, and the shepherds who all receive visit from angels speaking their language and explaining what’s happening, the Magi merely see a new star and are left to decide what to do about what they’ve seen. As weird as it sounds to me today, 5 months ago I did not want to move to California. When Chris got the job offer here, I congratulated him and then cried by myself. Trying to make a life in the Bay Area, in Silicon Valley seemed too ambitious. Houses here are twice as much as they were in Colorado, 4 times as much as Michigan. Everything’s more expensive here. Plus the pace of life, the culture of materialism, the radical inequality between rich and poor - where would I fit into all of that? There were 100 places where it seemed like it would be easier for us to go. I wrote out all my fears in my journal. Once I got the fears out I started to dream a little. I had a firm handle on what could go wrong. But for the first time I started to imagine what could go right. I remembered the mountains, the beaches, palm trees and redwoods. I thought about all the people we love here. I imagined all of the opportunities that exist living in such an innovative and well-connected place. And I thought about lemon trees. I love lemon trees. Looooooove. My grandma had one at her home in Monterey County when I was growing up. We had one in Berkeley. I love the smell and watching the fruit grow. I love every lemon thing: scones and cakes, fresh juice soaked into salmon, wedges squeezed in iced tea. I wrote down “lemon tree?” in my list of dreams and left it there. When we were house hunting, we couldn’t decide what we wanted. Tiny apartment downtown near campus? Condo in a family-ish neighborhood? A house an hour away? We started applying for places and quickly realized it wouldn’t be about what we wanted as much as what we could get. The market to get a rental is very competitive, with requests for us to send personal resumes and family photos. We got to the final round for a house on a hillside nearby and then got a text saying that they’d given the house to someone else but we were the next choice. I felt like the runner up in a beauty pageant I did not want to be in. We applied for a condo, only to be told that the HOA specified the unit could not be occupied by more than 4 people. I told the woman that I was keeping all my people so we’d have to pull our application. One landlord told me he preferred not to rent to people with children, another place seemed promising but wasn’t willing to wait for us to come out 5 days later when they could sign a lease with someone who was already in front of them. Then I found a Zillow listing for a small house in our price range and sent in my application without totally thinking it through. There were no pictures of the backyard, just the promise there was one. The photos they did have weren’t great; the place seemed old, and not in a charming way. I kept looking. But the little house’s landlord liked our application and offered us a lease long distance, sight unseen. We asked friends to go walk through for us, to make sure everything was on the up and up and then nervously committed to living somewhere we’d never laid eyes on. When we came for the first time to get the keys, I couldn’t stop smiling. I loved the blue tile in the kitchen, my very own laundry room, the closet with shelves built in. I could see how our family would fit here. Plus there was a pumpkin patch in the front yard which was delightful and unexpected. But my favorite surprise of all was the lemon tree blooming out back. I cried little tears, a gift flowering under our windows, a reminder that this new season might be challenging and the way forward isn’t yet clear, but there’s so much to look forward to. The first lemon from our California tree. This morning I went out to water the tree. I sing it it sometimes, because I can and because my tree never interrupts me on the chorus to say “Hey mom, Hey mom, Hey mom.” And as I sing my song to the flowering blossoms turning to little lemon buds, I marvel at the truth that sometimes dreams come true because we work and hustle and make it happen. But sometimes dreams come true through no fault of our own. That, I think, is Grace. On Thursday, we'll bury my Grams. I flew from San Jose to Denver with the boys last night. Flying with three preschoolers is never not an adventure. After a loud and lengthy discussion of the ways various body parts felt ticklish during the altitude changes on our way up, I brought out my laptop and found the inflight free TV channel, then realized I didn't have any headphones. "Sorry guys," I broke the news. "We can watch but we won't be able to hear anything." "Oh, that's ok Mom," replied B. "You can just read the words (i.e. closed captions) to us." Side note: I might be hard-of-hearing or maybe just a word person, but my kids think closed captioning is the way movies are made because I always need them on to understand what's happening. Turns out the free in-flight TV service didn't have closed captions so I just had to make up narratives whole cloth as we watched Deadliest Catch, Animal Cribs, Cake Boss and exerpts of Shark Week. I'm sure the people sitting around us were riveted by my explanations for why those guys were sending crabs down tiny slides in a snow storm. I woke up with the sun, the way I often do in an unfamiliar bed. The older two slept on, but the baby cried out for me so I snatched him out of his crib, pulling him into bed with me. As I held his squishy body, breathing in the intoxicating smell of laundered pajamas and baby shampoo, he looked at me and began to sing "Skid-a-mar-inky-dinky-dink, Skid-a-mar-inky-do, I love you." A heavy joy filled my chest, the ache of knowing a moment is totally delicious, an answer to 100 prayers, a gift and, at the same time, not mine to keep. I'm only five years into this parenting gig and I already deeply feel the always changing reality that babies become toddlers become preschoolers become... Cue Circle of Life. Pretty soon my little Simba will be ruling the pridelands and these sweet songs during morning cuddles will be no more. But in the middle, unlike Grams whose story is over. And that sweet baby whose has only just begun. No spring chicken but hoping for miles to go before I sleep. Not literally. I would like to sleep again within the next mile or two, lest anyone think my birthday wish is miles of physical exercise. I like those people. I am married to one. But I'm just hoping for kung pao chicken and a nap right after. Here in the middle today, I find myself welled up with gratitude. I love that this life of not-enough-sleep, constant lego-induced foot injuries, and physics jokes I don't understand is mine. It's better than I could have imagined. Also I am actually going to get my kung pao chicken/nap birthday wish come true. How rad. There are still dreams to chase and goals to meet and a daily sense that so much life is yet to be lived. It's exciting to realize I can still decide what I want to be when I grow up. It's also scary. I've spent a lot of the last year feeling afraid. Afraid of what's happening in the world. Afraid of Chris' not getting a job offer. Afraid of taking the wrong job when it was offered. Afraid of not having enough money. Afraid of writing anything in public because what if I change my mind later? What if I do more harm than good? Afraid of taking a next step toward a ministry job because what if it's the "wrong" one, whatever that means. Today, at 36, I want to be afraid of other things. Of not telling stories that should be told. Of not being honest when truth is called for. Of not enjoying today because I'm worried about tomorrow. Of not being present in my relationships because they aren't perfect. Of not listening to the Spirit's invitation to keep dreaming. This year the party looks like starting fresh and letting go and grieving and rejoicing and not being afraid. Also Snoopy makes an appearance. Because I only get one life and in mine I pay California taxes so I'm going to for sure get my money's worth of beach days. Here's to the middle, friends.